Flutters of undulating shine will make your heart skip a beat. This ring is crafted in polished 14K white gold, and features a center lined with 11 princess cut diamonds in channel settings. They are elegantly framed by a scalloped edge of 22 full round cut diamonds in prong settings. 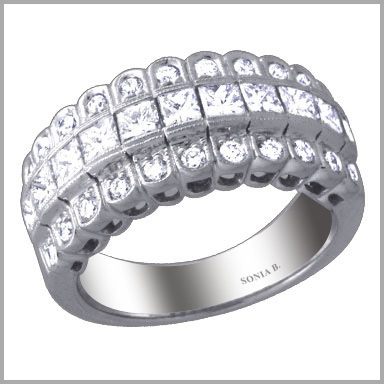 The total diamond weight is approximately 1.65ct with a color of G-H and a clarity of SI. The setting size is 5/16" x 13/16" with a height of 1/8".